Preserving books are another of our weaknesses. Really, if you know how to make jam, you really don't need a cookbook. If you don't know how to make jam the vast number of books explaining how to make jam can be daunting. What's a cook to do? Here's an idea. 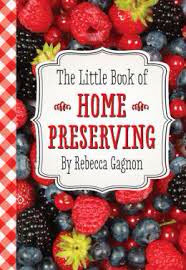 Grab a copy of The Little Book of Home Preserving by Rebecca Gagnon. It has everything one needs to know about canning a some interesting spins for those of you who can every week. It is the best of both worlds. Yes, it is a little book, but don't let its size fool you. Just because you can slip it into your pocket, might just be a good thing. Ever gone away for the summer and needed to find a reicpe? This book is perfect to toss into your hamper and take on the road. The recipes are fresh; familiar with a zippy spin. Try the Kumquat-Habanero Marmelade. How about Jicama Apple Cumin Kraut? Or the Citrus Chai Ground Cherry Preserves. She calmly explains that preserving is not always a precise endeavor and she wallks the reader through the vexing variations that occur while canning. We just love a good shrub, and this one will definitely be on our list. 2. Place the elderberries in a large glass bowl, crush them gently with a masher, and cover them with the vinegar. Cover tightly with plastic wrap, and store somewhere at room temperature out of direct sunlight for 1 week. 3. Strain the vinegar out of the elderberries into a large bowl, using a fine mesh sieve. Press gently on the berries to help them release all of their remaining juices. The vinegar will be a beautiful purple color. 4. Measure the vinegar and pour into a preserving pot. For every 1 cup of vinegar, add 3/4 to 1 cup of granulated sugar. Over very low heat, stir the vinegar until the sugar melts. (Keeping the vinegar well below the boiling point helps it to remain "raw" and healthful.) Once the sugar is fully dissolved, turn off the heat and remove the pot. 6. Let the drinking vinegar cool completely before storing in sterilized airtight glass bottles or canning jars at room temperature, where it will remain good for one year. To enjoy, pour 2 tablespoons in the bottom of a glass, and top with seltzer or still water. If you are looking for a niftly stocking stuffer this Christmas,The Little Book of Home Preserving is just the ticket. You can read more from Rebecca Gagnon at her popular blog, CakeWalk.